A new artwork by Gregor Turk succinctly and cleverly comments on Atlanta’s continuously changing landscape and what gets lost in the city’s frenzied bursts of development as homes and longtime structures are razed to make way for mixed-use developments, apartments and lookalike tract homes. Turk’s work is a 5-by-11-foot sign emblazoned with the words “Welcome to the Heart of Blandtown.” It’s installed in front of his studio at 1334 English Street in the historic neighborhood now better known by such real-estate friendly designations as Midtown West and Metro West. The sign features the titular words hand painted over a transfer image of an Indian head TV test pattern used from the late 1940s through the 1970s — a metaphor for the neighborhood’s “coming back on the air.” Turk used red laterite soil from a nearby construction site to give the sign an aged appearance. Turk’s studio is located in a 1960s cinderblock structure, which he bought in 2002. His neighbors at the time were, he says, “a crack house, a wood shop (still in operation), and a half dozen homes occupied by residents and vagrants alike.” Turk says that all but three houses, including his studio and a wood shop, were demolished in 2007-08, just before the recession brought redevelopment to a halt. Since 2015, the area, located just west of the Howell Mill reservoirs, has seen rapid commercial and residential development. In fact, Star Provisions and Bacchanalia, pioneers of the rebranded Westside, will soon relocate across the tracks (literally) to Blandtown because of rising rents. Turk’s studio is now dwarfed by new homes, erected by Steve Brock of Brock Built, that start at half a million dollars. Watching the neighborhood’s transformation and, in effect, erasure, moved Turk to call attention to its history. According to Larry Keating’s 2001 book Atlanta: Race, Class and Urban Expansion, the area was named for Felix Bland, a freed slave whose owner, Mrs. Viney Blank, willed the land to him. But Bland lost the land in the 1870s for not paying taxes, and in the 1880s a developer acquired the property and partially developed it as a residential area for the mostly African American community. Industry eventually gravitated to the area, but with the exception of a 1928 fire that left 75 people homeless, Blandtown was a thriving community until 1956, when it was rezoned by the city from residential to heavy industry. Its streets were turned into trucking routes, and railyards were opened and industrial companies with deep pockets moved in. Residents trickled out. 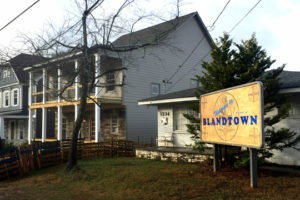 The last resident of the original Blandtown died in 2004, at age 85. Google street view of 1334 English Avenue in June 2012. Turk plans to keep the sign up through the neighborhood’s transition. He’d like for Atlantans to embrace the historic name just as other cities have embraced their quirky monikers, including Normaltown in Athens, Georgia, and Boring, Oregon. 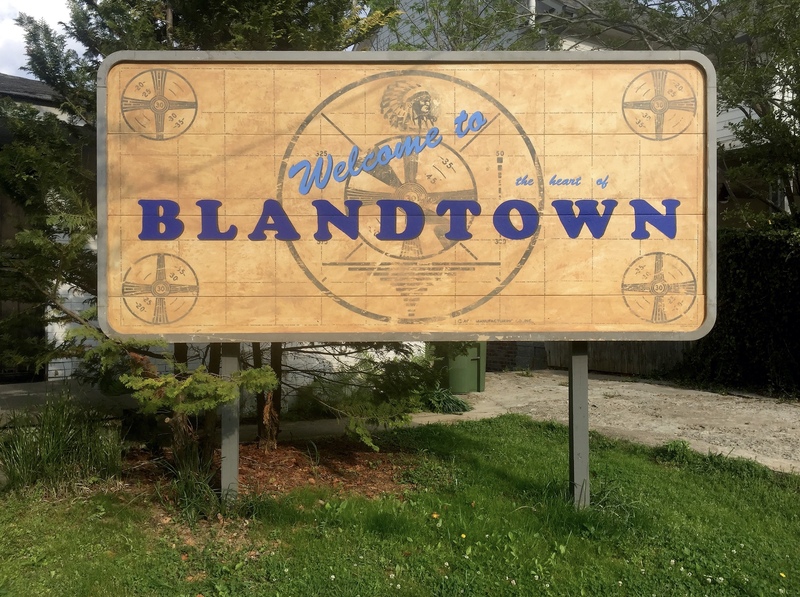 It was not his intention to create an official sign for Blandtown, though he’s heartened by the Blandtown Neighborhood Association’s interest in relocating it to Huff Road or Ellsworth Industrial Boulevard, which would more visibly put Blandtown back on the map. Stephanie Cash is Executive Editor of BURNAWAY.